If Coconut Cream Pie were to become a coffee, this would be it! It’s a cold, creamy and luscious. The nutty coconut gives it a tropical flair. This is the drink you want to be sipping as you enjoy a day relaxing in the sun. The drink itself is made of fresh coffee, vanilla ice cream and coconut extract. If the store had coconut ice cream, I’d have used that instead, but adding coconut extract works too. The topping is whipped cream and toasted coconut. Prepare toasted coconut in the oven in about 5 minutes. It’s super quick and easy. For presentation, I rimmed the glass in sticky marshmallow cream and filled it with lots of toasted coconut. Doesn’t it look so inviting and heavenly? Wow your friends and family with this recipe. It tastes even better than it looks! Watch for more yummy cold coffee drinks coming up. Check out my Beverages section to see the ones I’ve already shared. Do you think this recipe is one you’d enjoy? Cold, creamy and luscious! This is the drink you want to be sipping as you enjoy a day relaxing in the sun. Preheat oven to 350. Spread coconut on a baking sheet. Bake for 5 minutes or until golden brown, stirring once at about 2 1/2 minutes. Remove from oven and pour into a bowl. Place marshmallow creme into bowl. Place glass upside in the bowl to cover the rim. Dip glass into toasted coconut to cover the marshmallow creme. Set aside. In a blender, add ice cream, coffee and coconut extract. Blend until smooth. Pour into prepared glasses. Top with whipped cream and sprinkle with extra leftover toasted coconut. I always forget about coconut when it comes to smoothies/milkshakes….. This looks like a delicious milkshake! You’ve outdone yourself! I never heard of coconut ice cream, it would be fun to look for it and try it in this recipe. If not, I love vanilla, too! Oh wow this sounds awesome, I have no coconut extract but I don’t care I’ll still make it!! This looks delicious, it would be nice to afford to make all these delicious recipes. My sister invited me over yesterday for lunch, after she fixed something call Kahlua & Creme, I am not sure if I spelled that right, but this looks like it would taste even better. Thank for sharing. This looks so delicious. I would love to make a Coconut coffee milkshake right now, but I don’t have any coconuit extract. I have seen coconut frozen yogurt at my store. This looks so good! The only time consuming would be toasting the coconut. Ohhh I need to try this. It looks absolutely delicious. My sister would like this. I don’t like coffee or coconut. Oh my goodness! This looks delicious! I’m going to have to try this! Oh this looks so good, tried a few of your other drinks and they were so good, definitely going to try this one! Sounds like a great combination to me! Thanks for the recipe! This sounds ridiculously addicting and delicious! Something I’d definitely love. This looks absolutely delicious. 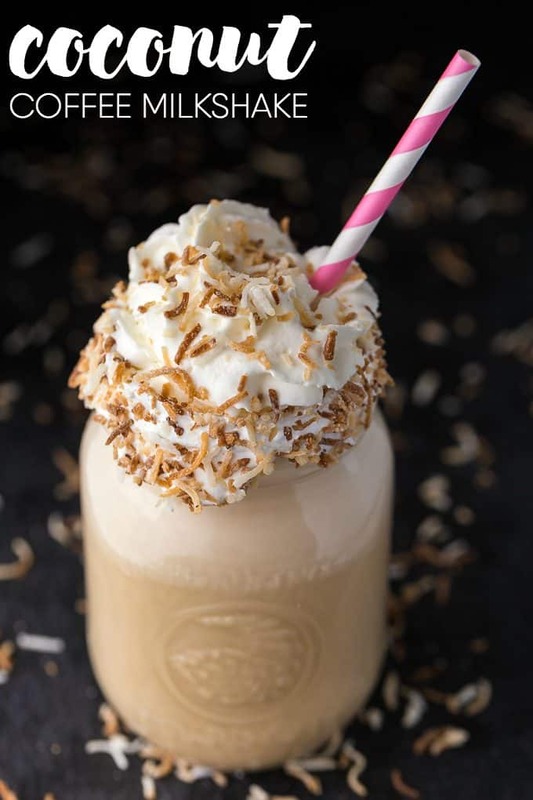 The toasted coconut really make it extra appealing. If I wasn’t on a diet I’d be all over this! It looks so fantastic, my first thought was… “hey, I’m trying to diet here!! !” hehehe. This looks devine! 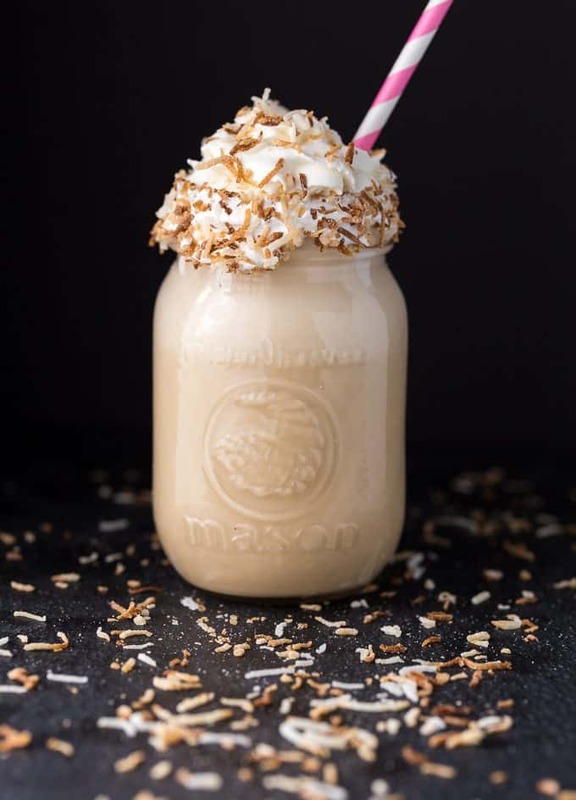 I love coconut and will be trying this soon! Wow, this looks really good. Well deserved after a long day! Visiting from Two Uses Tuesday. It’s my lucky day! I have all the ingredients on hand! Yum! Pinned this too! Wow! AMAZING! Yum! I love coconut. I would have never thought of this combination! Oh my goodness, this sounds amazing! 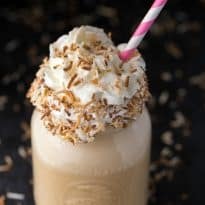 I love anything coconut and of course coffee, so this is perfect! You had me at COFFEE! Looks scrumptious! So lovely! i can’t wait to try it. Love the way you toasted the coconut– so pretty! I want to live near you so I can indulge in these amazing treats you make! Thanks for sharing with Small Victories Sunday Linkup and I hope you linked up with our Pintastic Pinterest Party too. Pinning to our linkup board and hope you found some great posts to visit this week! Oh my goodness, I love everything about this! Wow! This looks delicious and decadent! Besides, I’m always up for coffee. Thanks for sharing at Merry Monday this week! My two favorites, coconut and coffee! Yum! This looks positively divine, Stacie! Thanks for sharing at my Creative Ways LINk Party! I would love to try this type of milkshake,it looks delicious !